WT Birkalla is proud to partner with The Duke of Edinburgh’s International Award by supporting its Duke 4 Sport initiative. The Duke of Edinburgh’s International Award is a leading structured (non-formal education) youth development program, empowering all young Australians aged between 14 to 25 to explore their full potential. Young people are required to commit to getting active through physical recreation, learning or developing a skill, providing service (volunteering) in their community and learning the importance of team through an Adventurous Journey. 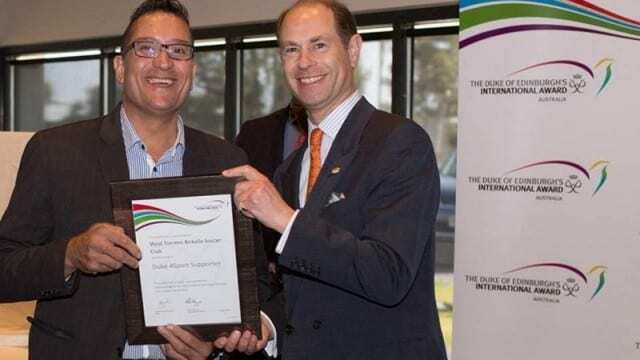 On the 17th April, Amin Ayoubi, Chairman was honoured to receive a certificate from HRH The Prince Edward, Earl of Wessex KG GCVO, in recognition of this partnership. Existing players at WT Birkalla who are currently doing the Duke of Ed through their school or other youth organisation, can be supported at the club, by undertaking their Physical Recreation and Service sections at the club. We are able to provide Assessors who can help young people agree goals and confirm their participation. If you are interested in learning more about the Duke of Ed, please email Aida Ashworth, Club Secretary – aida.ashworth@gmail.com or go to www.dukeofed.com.au for further information.